Persons born outside of hospitals or those who received only a hospital-issued certificate of birth may have difficulties obtaining replacement copies of their birth records. If the Department of Vital Records does not have a record on copy, they will need to create a new file, but first must obtain documentation that substantiates the birth data. 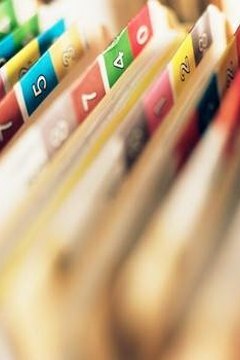 Compile medical records that attest to the mother's pregnancy. The Department of Vital Records may ask to see any official pregnancy test results and records from the mother's doctor or midwife that can help substantiate the child's date of birth. Prepare a document that affirms the name and gender of the child, the date and time of birth, and the city, county and state where it took place. Both parents should sign and date the final document in the presence of a notary public and list their own dates of birth and Social Security numbers. Provide other identifying documents. Older children and adults may be able to substantiate their identity and date of birth through school records, immunization cards and employment records. Obtain baptism records. If the parents are no longer living or there are no records of the mother's pregnancy, official church baptism records may be sufficient proof of birth to request a new birth certificate. If the Department of Vital Records rejects the requests after providing alternative documentation, parties may wish to consult with a family law attorney who can advise them on how to obtain a court order requesting a new birth certificate. Green, Anna. "How to Replace a Birth Certificate With No Record of Birth." , https://legalbeagle.com/5328896-replace-birth-certificate-record-birth.html. Accessed 19 April 2019.